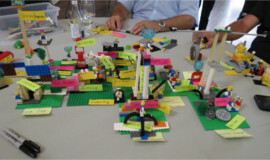 The LEGO ® SERIOUS PLAY &reg methodology is a facilitation process that awakens the imagination, and allows for 3D communication and complex and abstract challenges, using LEGO ® bricks to build metaphors and tell a story (Story Telling). It has been developed to mobilize and engage participants, de compartmentalize and build in collective intelligence a shared vision, improve innovation and organizational performance, free creative thinking and also turn ideas into individual and collective commitments. While problem solving, people quickly converge or filter too soon. As soon as an idea is put on the table, someone is playing the devils advocate and out goes the baby with the bathwater. Our process allows for both processes, or convergent and divergent thinking, to be applied appropriately. Time for incubation allows for creativity and innovation to flourish. This applied, creative process allows people to formulate and develop new ideas in a safe and open environment, where everyone’s true brilliance can shine through. All businesses today need the brainpower of every member to help navigate through the complex situations we are facing in this unpredictable marketplace. The process occurs in real time, meaning that it is relevant now and that action items are immediately ready for implementation. The true power of this application comes from the ability of the process to help people think for themselves in experiential situations. And the workshop situation is about a real life, work-related situation. 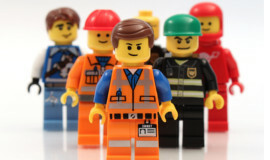 LEGO ® SERIOUS PLAY &reg methodology allows inclusion: all participants speak, listen, and learn from each other, regardless of their social and hierarchical position, and everyone’s true brilliance can shine through. The three skills; visual, auditory and kinesthetic are mobilized. It allows to develop the performance, by creating a strategy and a shared vision, by developing the collective intelligence at the service of a real cooperation; to innovate, freeing the creativity of all, turning ideas into concrete actions. But also to transform organizations, by becoming a full player in a successful structural and / or operational change. To get buy-in people need to feel part of the process, the solution.